With a higher resolution screen, a better camera, LTE support, and an OS that has been updated in the past eight years, the iPhone 7 is far superior to the BlackBerry Storm. Still there are a few things that the old phone still does better. With Apple releasing iOS 11 next month, lets hope that some of these features get included. The BlackBerry Storm had a messages app that combined multiple email accounts, SMS, BBM, Twitter, and almost all other messaging platforms into a single feed. 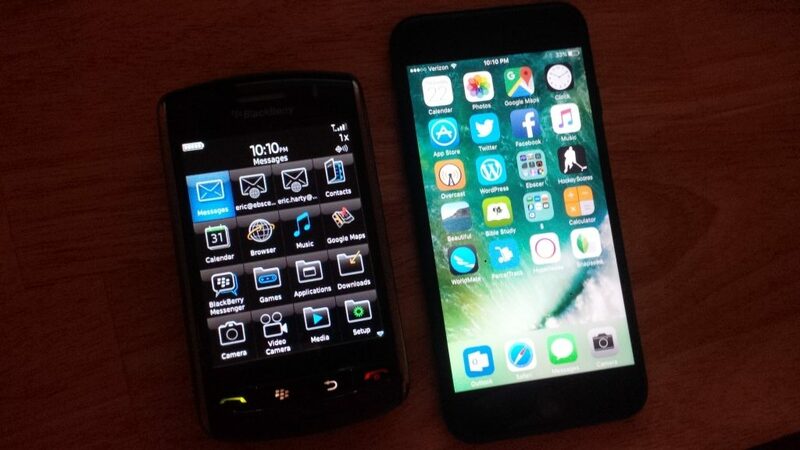 While not as complete as BlackBerry 10’s Hub, it was still superior to the siloed experience found on iOS. Attempts to address this issue on iOS with a notification center are not remotely useful. The default email client for iOS is bad in many ways. However the lack of push support for the world’s most popular email service is particularly embarrassing. Third party clients support this, and BlackBerry has had this feature since well before the iPhone was ever launched. One of BlackBerry’s simpler features was a small led that could be configured to blink different colors for different types of notifications. This allows you to know if you have any messages just a glance, and without even touching your phone. I am utterly baffled as to why other phone manufactures have not copied this feature. My iPhone has 128 GB of storage, yet I am unable to download email attachments simply because there is no place to just store arbitrary files. This could also be useful for transferring songs and pictures on and off from the phone. Apple’s attempt to hide complexity is actually making simple operations more complex. Honestly, neither the BlackBerry Storm’s click screen, nor the iPhone’s 3-D touch are good ideas. An interface that can work with a simple touch screen is a superior experience. But if you are going to have a clickable screen, you may as well commit to having a clickable screen. The 3-D touch feature on iOS is difficult to trigger intentionally, and in practice is more likely to trigger a long press event.